Born in Wellesley Township near the Kitchener Ontario area. He attended school in the village of Crosshill later coming to Kitchener for work at the Canada Skate factory. Kitchener Ontario was home to many leather based industries and attracted such men as Alfred Hackbart to factory work from the surrounding farm life. 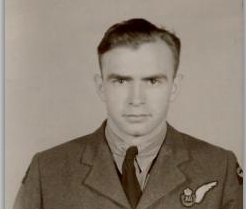 Five years after arriving in Kitchener, Hackbart enlisted with the RCAF on September second 1942. After completion of training at No. 1 Manning Depot, Toronto, he continued on to No. 5 SFTS at Brantford. The RCAF had a number of courses to upgrade recruits math skills to college level and Hackbart completed his stint at McGill with high marks in math and navigation. But as his cousin /foster sister explained he knew what position he wanted to be before he enlisted. With the position of Air Gunner in mind, he selected to follow that trade and completed training at No. 2 AGGTS at Trenton then No.3 B & G school at MacDonald Manitoba. The crew would take part in additional training at Middleton St. George with their captain MacLeod while they awaited MacLeod's completion of 2nd. Pilot operations, which were completed on November 18/19th. The next squadron operation was on the night of November 22/23 to Berlin. This would be the first full operation working as a crew. Their very next operation, Leipzig gave them taste of what can happen over heavily defended enemy targets. Flak penetrated their port wing, damaged the engine covers on the port inner engine. But the worst damage was to the port outer engine area where the flak punched a hole through the oil tank, causing loss of much needed oil for the engine. The aircraft was brought safely back to the base located at Weatting Common. Sgt. Hackbart would then be rear gunner on two operations over the German capital of Berlin. Then the crew once more were faced with an operation to Leipzig, a former target that had caused them problems back in the beginning of December. At 2312 hours on the night of February 19th, JD114 with Sgt. Hackbart in the rear gunner's position left base for Leipzig, to join up with 823 other aircraft. A smaller diversionary force was to have attracted the enemy fighters from the main force. But German controllers only sent part of the available night-fighters up to meet the diversion aircraft. They then called back that force of fighters when they saw what the main target was. Bombers were attacked all the way to the target, things were not any better over the target, winds brought bombers too early and wait the Pathfinders. Four aircraft were lost to mid air collisions and 20 were lost to the heavy flak over the city. In all 78 bombers were lost. 419 would loose two crews in this disastrous raid, one of them was the Halifax carrying Alfred Hackbart. No details of what actually happened to his aircraft was ever found. He and the other crew men are remembered on the Runnymede Memorial.